Welcome to the Missional.Life community of the Global Missions Health Conference and MedicalMissions.com. Here you can build your profile and stay connected to others in the healthcare missions movement. Community is imperative to the success of living a missional life. Sharing a story about your ongoing missional activity allows others to track your journey while encouraging them in theirs. Missional.Life allows you to share stories, pictures, and updates to your community about the mission you are on today. You can think of this as your missional resume. Within your Missional Community you can post the things you are praying for and let others know that you are praying for them as well. The Prayer Wall allows you to post and update prayers in real time so that your community can partner with you in your calling. 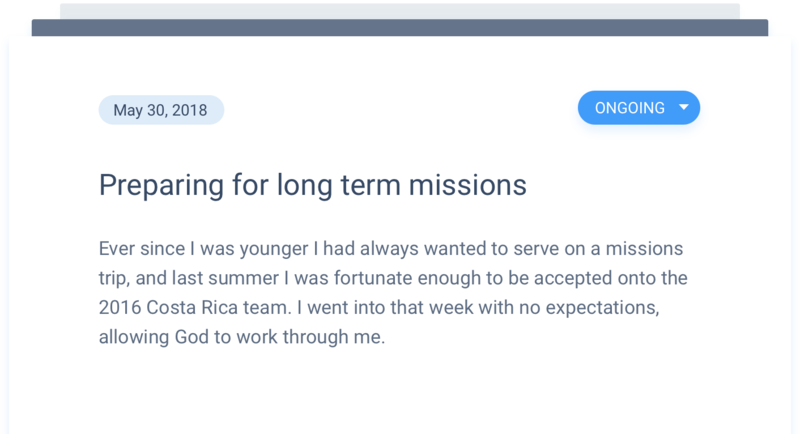 As you travel or once you're home, Missional.Life allows you to update your community with a post about every trip you take, whether out of the country or down the street. Each post allows you to pin your trip's location, upload photos, and share an update with your community of all that God did! Churches and sending agencies are critical components in our missional journey. Missional.Life allows you a way to connect with them and invite them into your journey so they can walk alongside you. As you prepare for your missional journey, it is likely that you have many goals and dreams, as well as some practical tasks to help you prepare for the road ahead. Whether it’s a class you want to take, a book you want to read, or a conference you want to attend, you can list those goals and tasks on your profile to encourage others and celebrate your hard work every step of the way! Find out how you can support those on the field and those preparing to go into missions. Be a member of the fastest growing missional community! Mobilizing people toward missional living.